The Radeon HD 4850 continues to be a better buy than NVIDIA's GeForce 9800 GTX, even if both are priced at $199. The overclocked, 55nm 9800 GTX+ manages to barely outperform the 4850 in a few titles, but loses by a larger margin in others, so for the most part it isn't competitive enough to justify the extra $30. The 4850 also uses significantly less power than the 9800 GTX+, and AMD was quick to point out that by the time the 9800 GTX+ ships that it will also have factory overclocked 4850s. That should make things even more interesting, because honestly, a factory overclocked Radeon HD 4850 is far more attractive to us than an overclocked GTX+. In a little over 12 hours we'll be able to complete the story with a full look at AMD's RV770 GPU and the Radeon HD 4870, so for a full, detailed performance analysis come back then. Until then, in short, the 9800 GTX+ doesn't really change anything for NVIDIA. NVIDIA needs to further drop the price of the GeForce 9800 GTX or GTX+ in order to make them truly competitive with the Radeon HD 4850. There's nothing more to it. 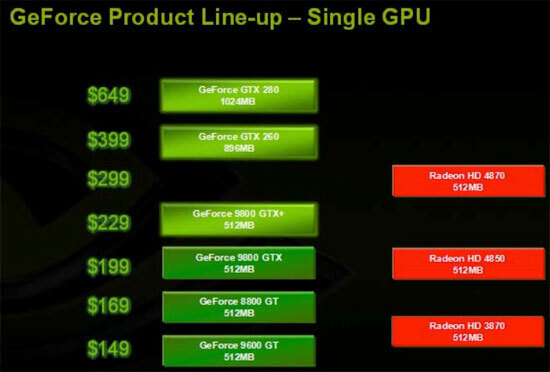 Price drops on the 8800 line are also necessary, which makes sense given the positioning of the 9800 GTX/GTX+. There's a reasonable chance we'll see some of the 8800 products disappear from NVIDIA's lineup in the near future, so if you've been contemplating adding a second 8800 GT 512 for SLI use, now might not be a bad time to do so; we're seeing cards priced as low as $160 with a $30 mail-in rebate now. NVIDIA probably started working on the 55nm shrink of GT200 as soon as the chip was done, so you can expect a die-shrunk version of it as soon as 6 months but I'd expect one in early 2009. Yeah how weird is that? Two companies that are such bitter rivals both use the same manufacturer. I didn't know they both used TSMC until a few weeks ago. Also I know it's just a name but I think Nvidia is retarded for their naming scheme the last few rounds. First the whole 8800GTS 640\320 512\256 then the 8800GSO\9600GSO which is basically a 9600GT and now the 9800GTX+. Really unimaginative and it just shows how much they're trying to capitalize on the 8800 name. They need to fire the guy who jumbled this thing so badly. You would think Jen-Hsun Huang would be on top of things like this. Unless this was his idea? Your right and a lot of people would agree. Nvidia's naming is so confusing that most people who aren't so tech savy wouldn't know if a GSO or the GS or the GTS or GT is faster. Not to mention they released the cards with different types of memory (512 vs 640) under the same name with the higher memory being slower, older version of the same card. How many people probably mistakenly bought the 640 version of the 8800GT without knowning the 512 was actually faster? Not everyone reads tech news daily. For that matter, the 9600GSO offerings seem to generally have less memory on a smaller memory interface, but more SPs. So maybe NVIDIA is confused over which should be faster as well. The 9600 GSO is basically the 8800GS video card renamed. Same 192 Bit memory interface and 384MB of memory. I believe 96 Shaders as well. The 9600 GT version has 64 Shaders but the clockspeeds are higher than the GS clocks and carries a 256 Bit memory bus. Whats sad is the GSO version could beat the GT version in certain things and the GT wins in other things. They are not clearly defined as they should be since they are carrying the same Model #. nVideo has the worse naming so far. Are the Oblivion numbers in the chart really accurate? You're trying to tell me the 9800GTX+ with 9.3% better core and 7.x% better shaders and the same speed RAM gets 15% better FPS in Oblivion?